Duke Basketball and United States National Head Coach Mike Krzyzewski cannot be defined solely by those accolades reserved for a highly successful sports coach. Indeed, Krzyzewski, entering his 36th season at Duke, has led the Blue Devils to numerous winning seasons, coached players who have produced superb graduation rates and crafted a tremendous on-court legacy. However, the Hall of Famer also sets the bar as a humanitarian of sport, an ambassador of education, a coach, a teacher, a friend, a family man, a leader and a motivator. While fans worldwide know the three-time national champion as “Coach K,” his three daughters call him their “hero”, his players regard him as a father figure and his coaching staff and close friends consider him the ideal mentor. In a single word, Mike Krzyzewski is superlative. Born on February 13, 1947, Michael William Krzyzewski [pronounced Sha-shef-ski] grew up in Chicago, IL and attended Weber High School. Following high school, Krzyzewski enrolled at the United States Military Academy, where he became a three-year letterman from 1967 to 1969. In 1969, as a team captain, a second team All-NIT honoree and a North-South Game participant, Krzyzewski graduated with a B.S. degree from West Point. After serving five years as an officer in the United States Army from 1969 to 1974, Krzyzewski began his college coaching career as a graduate assistant at Indiana University under Bobby Knight, his former coach at Army, in 1974-1975. Krzyzewski’s first head coaching position came a year later when he returned to West Point in 1975. In his five years at West Point, Krzyzewski led the Cadets to a 73-59 record and one NIT appearance in 1978. On May 4, 1980 Mike Krzyzewski was introduced as the head coach of the Duke Men’s Basketball Team. After some difficult early seasons, the Duke program has become one of the most successful of all time. In 28 years at Duke, Krzyzewski, a 12-time National Coach of the Year, has built a dynasty that few programs in the history of the game can match. Named “America’s Best Coach” in 2001 by Time magazine and CNN, Krzyzewski has earned nearly every award imaginable. Also in 2001, Krzyzewski received basketball’s highest honor when he was enshrined in the Basketball Hall of Fame. 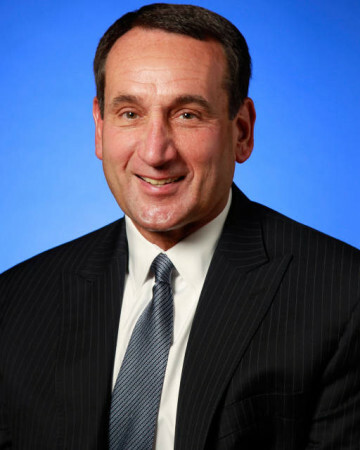 Krzyzewski added to his already impressive list of accomplishments on Sept. 26, 2005 when he was named head coach of the USA Basketball Men’s Senior National Team program for 2006-2008.